Tonight Al Gore could win an Academy Award for “An Inconvenient Truth.” Later this year he could also win the Nobel Prize for Peace. And if he lost 50 pounds and jumped into the 2008 presidential race, he could win that, too. 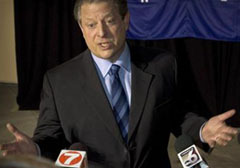 Ever since he published “Earth in The Balance,” his 1992 best-seller, Gore’s two issues have been global climate change and himself. The first, global climate change, is drawing the nation inexorably to logical choices about energy, metropolitan development patterns, population, conservation, and transportation. The catch phrase here is doing much more with much less. The second, Gore himself, is the problem of already having much more and working really hard to do less. It’s like dragging the best trumpet player in the marching band out to perform the Star Spangled Banner. Reluctance doesn’t begin to describe Al Gore’s nearly 20-year romance with true greatness. He abandoned almost any mention of the environment in 2000. Bush’s pledge to abide by the Kyoto Protocols, which he abandoned immediately upon crossing the White House threshold, attracted more attention. Nevertheless here Gore is again ready to take a bow for superb leadership, while the rest of us who’ve been frustrated and inspired wonder what he intends to do with his favorite issue and global prominence. The momentum to change the rules of the development game, and to frame it around battling global climate change, is so intense that even George Bush stepped out on on the White House lawn for a moment last week to tout electric cars, a kind of presidential Punxsutawney Phil moment, to see if he could cast any shadow of influence over the issue. The president looks smaller these days, more pinched and stressed and embarrassed, almost like Michael Dukakis looked in 1988 when he put on that military helmet and rode in the tank. No so Al Gore, who commands every stage he strides across. No one knows more about global climate change than he does, and no one inspires more confidence on the issue. A few weeks ago Gore was the guest of honor in New York at the World Resources Institute’s 25th anniversary celebration, helped raise $2 million, and showed yet again the star power that green issues have attained. Not since the first Earth Day in 1970 has the environment gained such stature and invited this much attention in economic, cultural, and political circles. The question is whether Gore will complete the mission. As those of us who make the case and organize to shape new ideas know, it still takes government to draw the players and capital together to make big public interest ideas a reality. The federal government has the capacity to act. Its record on the environment is superb. What the United States has done to clear the air, scrub the waters, protect endangered species, encourage research and new findings, ensure natural areas, and all the while grow the economy, has few equals in the annals of public interest policy making. As Gore noted in 1992, and again over the last few years, the earth is in the balance. Will he take command of the Oval Office and really do something about it?